Prepare a PowerPoint of your family with photographs of your father, grandfather and perhaps great grandfather. Show this to your class talking about each person and making the relationships clear. For example, ‘This is Neil Curtis and he was my father’s father which makes him my grandfather. He lived in a small country town but was born in London’. Engage with the students and their stories. Some students may not know their grandfathers nor have extended families but will be interested in your photographs and stories. Introduce Wilfrid Gordon McDonald Partridge. Read the title, author’s name and illustrator’s name. Ask students to name books they have read by the author Mem Fox. List the books they know and why they like these books. Add the names of books by the illustrator Julie Vivas. 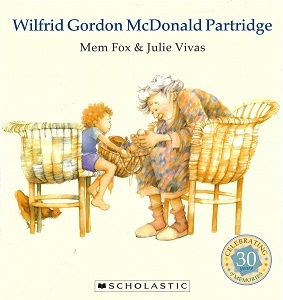 Wilfrid Gordon McDonald Partridge was Mem Fox’s grandfather. The theme is about memory loss. Put students in pairs to do a think-pair-share about the thing that interested them most on this page. List their responses to come back to later. Follow up with a short discussion about the function of an old people’s home. What do you know about the author and her style of writing? Her other books? What do you know about the illustrator and her style? What do you know about elderly people? Do you know anyone who might be as old as the lady on the front of the book? Next either play this Read Aloud video for the students, or do your own reading. This is a time for your students to listen and enjoy the book. You may choose to read it twice if they are engaged. Allow students to talk in small groups after the reading just to chat about what they are thinking and wondering about. ‘Eavesdrop’ as you move about the room to get an idea about the connections your students are making to their own experiences, things they have read, etc. Now put students in groups of four or five with a copy of the book. Ask each group to choose one of the elderly people in the book and write some words to describe them. Some might come from the text and some might be something they find out about their character from the illustrations. Allow time for the students to browse the book, discuss the illustrations and chat about their chosen character. For example they may notice that Mrs Jordon wears glasses and Mrs Mitchell seems to like big hats. Encourage students to create an oral history about what their character might have been like when they were younger. Students begin to create their own book of memories. This will be added to throughout the unit. This first entry will be about a memory each student has of an older person that has been in their life. This might be an elderly relative or an older person they have not seen for a long time, for example a family member who is overseas. The first entry can be an image and one or two sentences about their person. Reread Wilfrid Gordon McDonald Partridge. With each reading your students can be guided to notice the words. The words in this book are perfectly chosen making it a delight to read aloud. After reading prompt students to notice something new in the words or illustrations and allow them to make text-to-self connections. Allow a few minutes to share with a partner what they are thinking and wondering about. The illustrations allow space for imagination. Some students will see this book to be about friendship which may lead to a discussion of all the different friends a person might have. Miss Nancy Alison Delacourt Cooper was Wilfred’s friend. She is unique and special and the relationship is important to Wilfrid. Return to your PowerPoint and show your grandfather or elderly relative. Describe his appearance pointing out things that may not be immediately noticed. You might make a comment such as, ‘He is well dressed in this photo which was very unusual. Grandfather was a mechanic and loved wearing his overalls, even when he retired.’ Next describe your relative as a person. You might say, ‘Did you notice my grandfather’s face? He looks very serious but I remember him as a happy man. He had smiling eyes.’ Invite students to suggest some questions that they would like to ask your grandfather prompted by the photographs. Invite a grandparent to the classroom. Before the visit ask students to work in groups to devise one question that could be asked of the visitor by the group leader on behalf of the group. Ask one or two students to prepare a welcome for the visitor and give a brief summary of the book Wilfrid Gordon McDonald Partridge and what that book has made them think about. Return to the Mem Fox website and reread what the author has written about the narrative. Stop at the statement, ‘The theme is memory loss’. Discuss briefly and then finish reading the remainder of the text that gives some details about what inspired the author’s development of the characters. Now read Wilfrid Gordon McDonald Partridge. Have students identify what each character answered when the boy asked them, ‘What’s a memory?’ Allow students to explore these answers in groups. Was there one answer they liked best? Why? What did the answers make them think about? Were there any answers that were confusing? Follow up by organising the students into groups of eleven (elderly people, parents, Wilfrid and narrators) to read the text using reader’s theatre. The teacher can create a simple reader’s theatre or go to the resources section for an example. Finish by inviting students to ask a family member (elderly if possible) the same question: ‘What is a memory?’ These can be shared in a later session (see assessment task). Why do you think every person in the old people’s home had a different answer? Were any answers better than others? Why? Why not? What is your answer to the question: What is a memory? On the title, who do they think the empty chair is for? On the page where Miss Nancy holds the egg, who is the girl in the illustration? Whose chair is it on the end page? Reread and discuss the text structure of Wilfrid Gordon McDonald Partridge. Revise the key meta-language to discuss structure. Students will identify and discuss the orientation, events, complication and resolution. Orientation: description of main characters and the setting. Events: Wilfrid’s parents talking about Miss Nancy losing her memory. Complication: Miss Nancy’s memory is lost. Wilfrid tries to find out what a memory is. Resolution: Wilfrid helps Miss Nancy remember. In small groups have students read the book and map what they believe to be the key events in the narrative. Example: Wilfrid heard his parents say Miss Nancy lost her memory. Give each group of four to five students a copy of the book. Appoint a reader and ask the group members to listen for any sentence patterns they hear. Discuss the discoveries (possibly rhyming words, etc.) before drawing attention to the sentence structure repeated for each character: ‘He liked Mrs Jordon who played the organ’. Have the groups talk about these sentences. Highlight the sentence structure and the use of adjectival clauses beginning with ‘who’. Ask the groups to invent a new character for the old people’s home and write a sentence using the same structure. For example, Mrs Hunter who used a walker. Oral sharing: teacher observes and monitors students’ responses. Each student writes a sentence for a new character using the same structure explored in the last activity. Invite students to draw and label their character possibly drawing on characteristics of someone in their own family. Spend some time exploring memory by identifying how the concept of memory is represented in the written and visual text. Discuss how memories are connected to feelings and emotions. Ask the students if they think memories are important? Do a think-pair-share about a good memory at school this year. Return to a whole class group and allow students to share their partner’s memory. Record these on a class Padlet to read later. Prepare for this session by asking students to bring in a small object that holds a special memory. This might be a special book that reminds them of someone, a souvenir from a holiday, a photograph of an old friend, etc. In pairs allow students to share and talk about the object and the personal memory it represents. Then form a whole-class sharing circle and invite students to discuss how each object represents or is significant to their memory and share with the class. This should be voluntary. Students prepare to write and share their memory. Discuss who the audience might be (whole class, another class in the school, invited guests, etc.). Decide the purpose and audience for the writing. Parents and caregivers might be invited to an afternoon when the writing is shared. Students can collaborate to retell, perform or digitally present their memory with the connection to the object. Assessment would include observation of each student’s ability to retell the key events of their memory, using adjectives to describe and making connections between the text and their own experiences. Allow some individual writing time before forming small guided writing groups. Students share their written text with their group and revise as required. Revision will involve checking one-to-one correspondence and checking for meaning. Group members might ask questions that will lead to details being added to the writing. Students redraft and practise reading their sentences or paragraph that retells their memory (created in previous guided writing group). Retelling can be written or recorded for sharing. Alternatively make a class PowerPoint with photographs of the objects and the retelling. Students share their final retelling of the memory to the audience identified. For example, parents, friends or relatives visit the classroom or the recorded retells could be shared in a public forum or sent home to families. YouTube reading of Wilfrid Gordon McDonald Partridge. Go to the Mem Fox website to find out more about the author, her books and her awards. Find out about the illustrator, Julie Vivas and her books. Read an interview with Julie Vivas. Teaching activities and images from the book. Reader’s Theatre adaption of the text. Duration 3–4 Weeks with 3 sessions a week. LISA VAN LEENT is an experienced primary school teacher and early career academic. She has worked in primary schools in Queensland and Victoria. Her recent experience as a literacy coach in Queensland has provided a depth of knowledge and understanding of teaching literacy. As a lecturer at Queensland University of Technology, Lisa teaches undergraduate teachers English curriculum studies and multiliteracies.